From left to right, the AKG K712 Pro and K612 Pro. 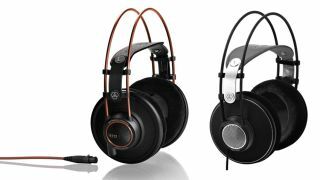 AKG is one of the big players in the studio headphones market - we've recommended their models in the past - and it's just released a couple of new sets in the shape of the K712 Pro and K612 Pro. The hand-crafted K712 Pros are billed as "reference, open, over-ear headphones for precise listening, mixing and mastering". Their over-ear design is said to make them comfortable to wear, while a "spacious and airy" sound is also promised. They'll set you back £379. Designed for monitoring, the more affordable K612 Pros are "high-performance open, over-ear phones that deliver natural sound". Again, they're said to be comfortable and spacious in their sound, which we're told is also enhanced by AKG's Varimotion diaphragm technology. This pair can be yours for £149.